Saw this yesterday, on my way back from my walk. Yesterday was another light day where I was able to dash home a tad early and present myself at the walker's park. 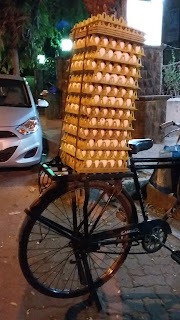 The eggs on a bicycle is not a common sight in Mumbai, but I have seen these fellows ride their bicycles, swaying dangerously, with larger stacks of eggs. I think this is going to be one of those sights that will disappear soon. I'm trying to catch, among other things, the tempos carrying milk cans and cows strolling the streets. I remember trips to Mumbai where they'd be sleeping in the middle of busy roads. 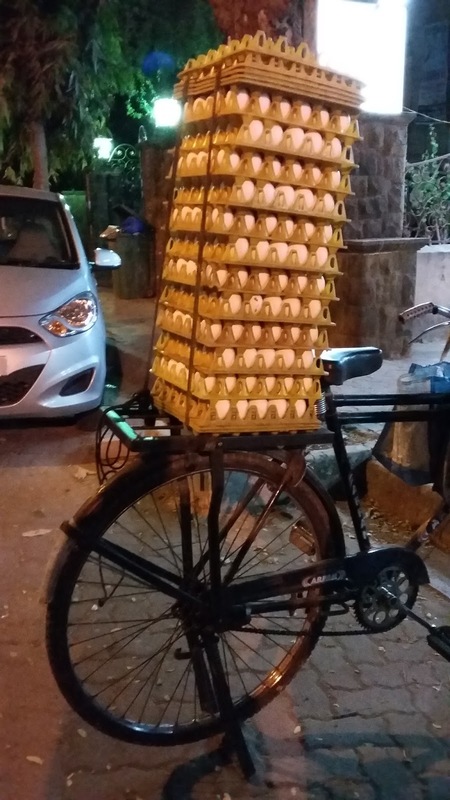 It has not been a common sight for many years, but I think the beef ban in Maharashtra may make them think differently.